Teams track progress in many different ways. Most commonly I see variations on a burn down chart. But if you’re finding that a little bit boring, then there’s no reason not to get creative to illustrate progress. Here’s an idea from a team working their way through every country in the world. Each country gets coloured in as it is completed. Stakeholders can see the progress as it happens, and also whether the country they are interested in has been completed yet. If you click on the image below, the animation shows the progress over a few weeks. Teams get their best work done when they can concentrate and focus on the task at hand. Switching back and forth between different tasks interrupts your train of thought and it can take a long while to get back on that train. Tom DeMarco recognised this more than a decade ago when he wrote “Peopleware“. But of course sometimes interruptions are unavoidable. When we say we value conversations as the highest-bandwidth channel of communication teams can use, we are inviting interruption. Or someone from another team has a technical question. Or sometimes a production issue comes up that needs immediate attention, or a developer is the only person who can help unblock someone else’s work. So how can we minimise these interruptions? The team chose a ‘fireman’. Someone whose job it is to extinguish any of these fires as soon as they happen. 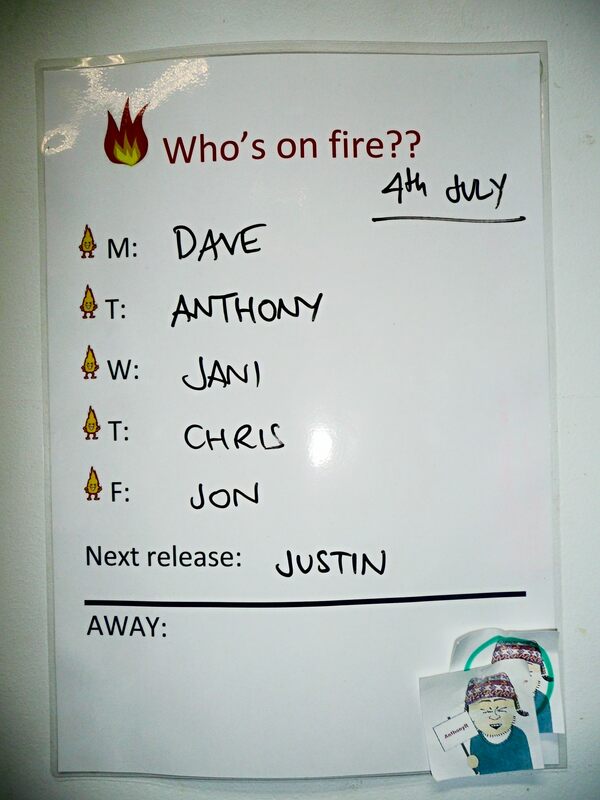 Team members take turns to be the fireman, and the fireman for the day is clearly shown on the team board so that everyone knows who they can tap on the shoulder to help them. As well as keeping the rest of the team focused on their work, it means the people with the questions don’t feel guilty about interrupting someone.